The auditory pathway of the human body consists of reception of sound at the ears, translation of sound energy into electrical impulses in the inner ear, and the transmission of these impulses to the auditory cortex of the brain and reflex pathways. The human ear functions essentially as a transducer – where sound waves are channeled from the environment to the middle ear and get converted to electrical signals by the cochlea. The cochlea transmits the electric signals through the vestibulocochlear nerve (CN VIII) which carries this information to the auditory cortex in the brain, which is located in the temporal area and within the lateral sulcus. In this article, we will discuss mechanotransduction of the sound energy received by our ears, and its pathway to the auditory cortex of the brain. Sound waves are channeled by the external ear and enters the auditory canal. 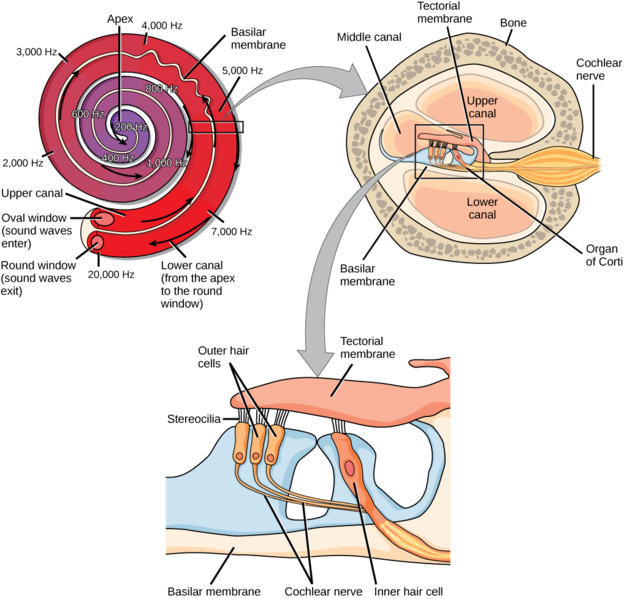 The sound waves hit the tympanic membrane and transmit the force of the sound waves onto the oval window of the cochlea through three ossicles – malleus in contact with the tympanic membrane, incus and the stapes in direct contact with the oval window. The force of transmission to the oval window is regulated through the stapedius muscle (controlled by the facial nerve) and the tensor tympani muscle (controlled by the trigeminal nerve). 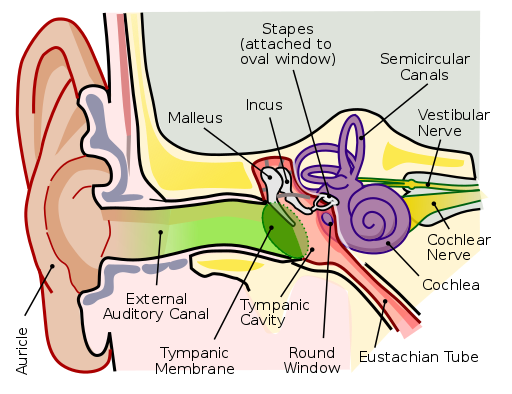 Fig 1 – Diagram demonstrating the anatomy of the ear. Perilymph is continuous in the two ducts through the Helicotrema – a gap allowing equalization of the perilymph pressure within the compartments and separated from each other by the Scala media. The Scala media is in particular also surrounded by the Stria vascularis (sitting in the spiral ligament). Further information on the anatomy of the inner ear can be found here. Fig 2 – Structure of the cochlea, and borders of the cochlear duct. 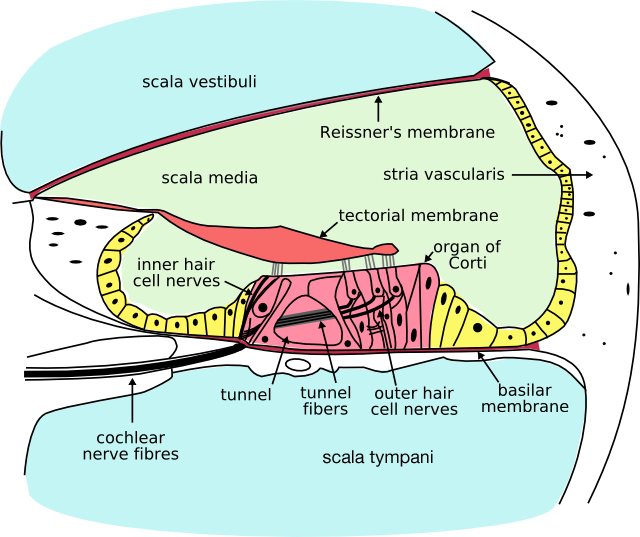 The Basilar Membrane – separating the Scala Media from the Scala Tympani. The Organ of Corti is a sensitive structure that is located on the basilar membrane and is responsible for converting mechanical oscillations into electrical impulses transmitted through the vestibulocochlear nerve. It is made up of many taut, radially placed parallel nerve fibers. The nerve fibers are arranged progressively of increasing frequencies progressing from the base of the apex to the cochlea. Fig 3 – Cross section of the cochlea showing the three fluid filled compartments. When the basilar membrane displaces upwards, the membrane with the hair cells moves upward and backward, whilst when the membrane displaces downwards, the membrane with the hair cells moves downwards and forwards. The bending of stereocilia on the hair cell tips results in the opening of K+ channels, causing depolarisation. This depolarisation then causes calcium ion channels to open and neurotransmitters are released onto the spiral ganglions – following which it is transmitted along auditory pathways to the auditory cortex. Fig 4 – Diagram showing the structure of the cochlea, including the inner and outer hair cells. As the fluid filled compartment within the cochlea is a finite space, the excess pressure from the Scala vestibuli, is transmitted across the cochlea to the Scala tympani which releases the pressure through the round window, which bulges out in phase with the oval window. The mechanical vibration of the Organs of Corti are changed into inner hair membrane potentials which are then transmitted through the vestibulocochlear nerve (CN VIII), with each fiber of the nerve being tuned to a particular characteristic frequency. Spiral (or cochlear) ganglions innervate the Organ of Corti which feed into the vestibulocochlear nerve. The auditory messages are transmitted to the brain through two pathways: the primary auditory pathway which exclusively carries messages from the cochlea and the non-primary pathway (reticular sensory pathway) which carries all types of sensory messages. The first synapse occurs in the cochlear nuclei when the axon fibers of the vestibulocochlear nerve end in the ventral and dorsal cochlear nuclei from which axons are sent crossed and uncrossed in a rostral direction. The cochlear nuclei of the brain stem receive Type 1 spiral ganglion axons: duration, intensity and frequency of the sounds are analyzed here. The second synapse is located in the superior olivary complex, with the majority of the auditory fibers coming from the cochlear nuclei having already crossed the midline at this point through the trapezoid body. Following this the fibres travel rostrally to the inferior colliculus, which allows us to localise sound. From here fibres project to the medial geniculate body (MGB) within the thalamus. The MGB integrates auditory stimuli in preparation for a motor response. Finally fibres travel from the MGB to the primary auditory cortex in the upper and middle parts of the superior temporal gyri, where the message is recognized, memorized and integrated into the voluntary response. The auditory association cortex (Wernicke’s Area) is located around the primary auditory cortex. From the cochlear nuclei, small fibers connect with the ascending reticular formation in the midbrain where the auditory messages join all other sensory messages. It then synapses in the non-specific thalamus nuclei before the pathway ends in the poly-sensory associative cortex, in the outer layer of the cerebrum. This pathway acts to prioritize different sensory messages according to need. Reflex responsive to auditory impulses occur through strong sudden sounds. This results in turning of the eyes and head toward the original source of the sound. Reflex connections pass to the eye nuclei and motor nuclei of the cranial and spinal nerves through the tectobulbar and tectospinal tracts. Connexin (gap junction proteins) mutations do not allow the potassium ion to return back to the endolymph from the perilymph which can cause sensorineural hearing loss. It is the most common mechanism of genetic hearing loss. DNA testing can be performed for mutation in the connexin 26 gene, also called the gap junction protein beta 2 (GJB2) that can be performed in children who present with congenital sensorineural hearing loss. Sensorineural hearing loss can occur through interruption of the cochlear nerve fibers from the hair cells to the brain stem nuclei. This can occur through a cerebellopontine angle tumor, which usually involves both the cochlear and vestibular nerves. The site is a usual growth space for vestibular schwannomas. They are managed through surgical excision, radiation therapy or observation as these tumors are slow growing and follow up scans are only needed every 6-12 months in selected patients. Bilateral vestibular schwannomas are a characteristic clinical feature of Neurofibromatosis Type 2 (NF2), where the NF2 gene is mutated and produces an abnormal shortened version of Merlin protein, which normally acts as a tumor suppressing agent. The tumors are detected through magnetic resonance imaging (MRI) and can also be screened through brainstem-evoked response audiometry (AER/ABR).